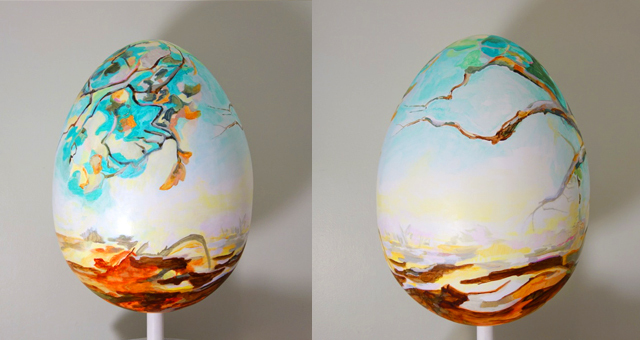 Exciting news: I have been selected for a prominent public art event in NYC called The Fabergé Big Egg Hunt along with Jeff Koons, Francesco Clemente, Julian Schnabel, Jennifer Bartlett, and April Gornik, as well as 200 other artists and designers. As a fundraiser for two great organizations, Studio in the School and The Elephant Family, the event culminates with an auction of the eggs at Sotheby's on April 22, 2014. My Egg is called Enchanted. It is based on the idea of being inside an enchanted forest, with two trees intertwined, one whose branches cascade a canopy of leaves which lead to an open meadow in the distance. Please see below...the four main panels of my Egg!